Simmons talked about his Celtics fist pump, a PTI word choice, and more. 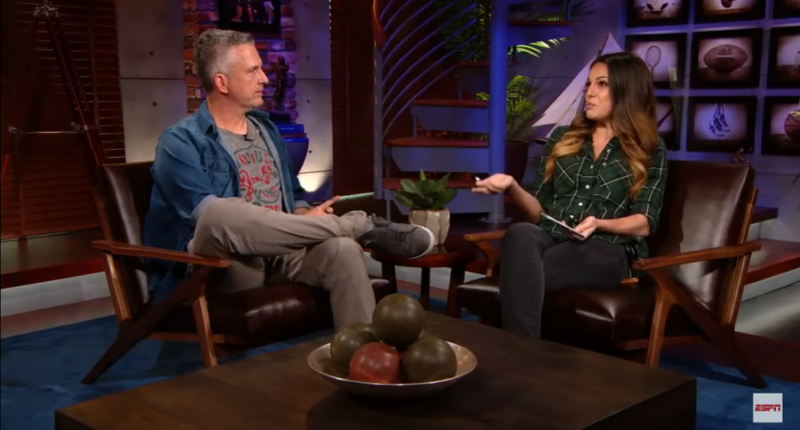 Bill Simmons had a very messy public breakup with ESPN back in 2015, but there have been signs the relationship is thawing a bit, most notably Simmons’ presence in the upcoming 20-hour documentary Basketball: A Love Story. But it was his appearance on ESPN+’s Always Late with Katie Nolan that is probably most relevant here. Nolan had Simmons run through a series of his more famous on-screen moments/gaffes, which was entertaining for fans of Simmons and rewarding for his many critics, in equal measure. Nolan covered some fun moments; Simmons celebrating the Celtics draft choice is a good one, made better by the fact that he didn’t realize James Young was still hanging around the NBA periphery. That’s a very reasonable explanation, of course, but it’s perfectly Simmons in that it tossed in a reference to “stupid sports blogs” getting worked up over a possible conspiracy theory, which is rich coming from one of the original sports bloggers who spent years entertaining the theory the NBA’s draft lottery was rigged to send Ewing to the Knicks, and that Michael Jordan was suspended for gambling, among others. In all, it was an interesting segment, though it’s still a bit weird to have Simmons back on ESPN, even if this is just a one-off return in support of a documentary.